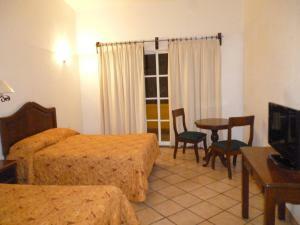 Hotel Antiguo Fortin is a popular choice amongst travelers in Oaxaca, whether exploring or just passing through. The hotel offers a high standard of service and amenities to suit the individual needs of all travelers. All the necessary facilities, including 24-hour front desk, facilities for disabled guests, luggage storage, business center, newspapers, are at hand. Designed for comfort, selected guestrooms offer wake-up service, desk, balcony/terrace, fan, television LCD/plasma screen to ensure a restful night. The hotel's peaceful atmosphere extends to its recreational facilities which include garden. Friendly staff, great facilities and close proximity to all that Oaxaca has to offer are three great reasons you should stay at Hotel Antiguo Fortin.